Joint wrap seals for manhole joints and pipe joints, stops infiltration through the joints. Manhole joint seals WA-JW units, press into the joint for a waterproof seal. 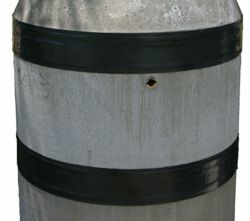 The rubberized mastic bonds permanently with the structure and prevents infiltration into the manhole or concrete pipe. 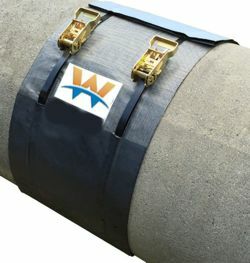 WA-JW wrap seals are an advanced external joint wrap, designed to prevent water infiltration. The wraps may be used on reinforced concrete pipes, manhole joints, and other round or elliptical concrete structures. They exceed ASTM C 877 (Type II), standards for external joint seals. WA- JW Joint Wrap has a mastic base layer that adheres aggressively to concrete, and continues to “cold flow” at typical ground temperatures. Back filling actually increasing its bonding capability. - The seal wraps bonding ability is further enhanced by compression bands. Tensioning ratchets allow the installer to position the wrap before back filling. Backfilling further compress the mastic under surface. - A woven polypropylene internally laminated layer of high shear strength, increases puncture and shear resistance. - Flexibility of the joint wrap will accommodate some settlement at the joint gap. Wrap Seals for reinforced concrete joints. 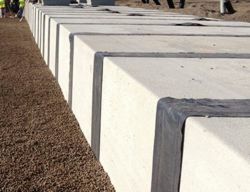 Joint wraps for reinforced concrete structures, may be used on a variety of precast chambers. 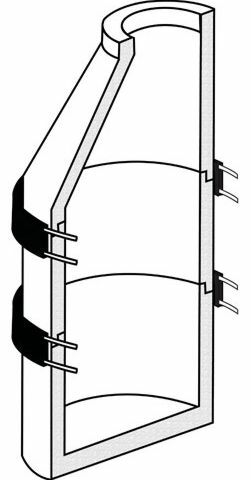 The wrap prevents infiltration on both vertical and horizontal joint connections. Applications for joint seals on storm-water retention systems, box culverts, junction boxes, septic and many other precast structures. Pipe leak inflow seal wraps have custom backings to resist and prevent infiltration of hydrocarbon concentrations. Joint wraps may be used for permanent above ground installations. Pipe sealing wraps may be used on most pipe types. Buildings and other structure waterproof seals. Joint wrap seals: low pressure pressing water infiltration protection. Ground water enters the sewer collection system through manhole joints. Inflow into the manhole can be reduced by installing joint wrap seals. Joint Wraps are externally attached around the joint with a custom compounded butyl-based wrap sealant. The wrap is designed to create a seal protection for precast structures and pipe joints. By applying and external tape seal, manhole joints are protected against low pressure infiltration. External Joint Wraps provide excellent adhesive and cohesive strength, they are self-priming and self-healing. Highly resistive to temperature extremes and acid or caustic environments. 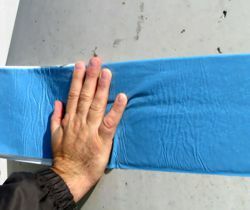 External joint wrap remains permanently flexible and is easy to applied. In addition to leaks occurring at the section joints, pipe-to-manhole entry openings require leak protection seals. manhole joint, wrap seals, concrete pipe seal wraps, prevent infiltration, repair, joint wraps, USA and Canada. USA: Texas, TX, Houston, New York, NY, Illinois, IL, North Dakota, ND, Iowa, IA, Ohio, OH, Michigan, New York, NY, Utah, Arkansas, Kentucky, KC, California, CA, Colorado, Denver, Louisiana, LA, Florida, FL., Pennsylvania, PA. Wisconsin, WI. Canada, Ontario, Oakville, Toronto, London, Hamilton, Mississauga. Alberta, AB; Edmonton, Fort McMurray Calgary. British Colombia, BC; Kelowna, Vancouver, Prince Rupert, Kitimat. Saskatchewan, SK; Regina, Saskatoon, Prince Albert, Estevan, Swift Current. Manitoba MB; Winnipeg, Thompson. Quebec, QC; Montreal, Quebec City, Trois-Rieviers, Chebougamau, Sherbrooke. QC, Alberta, Saskatchewan, Manitoba, Quebec, New Brunswick, NS, Newfoundland, NL.